What I liked about it: This is the first book in the Serrated Edge series, and it is a bit dated now. But when I read it, all those things turned into quaint details. This is a surprisingly complex book, and a book I urge everyone to read. Yes, I know it is an urban fantasy. The focus of the conflict is the animosity been Keighvin Silverhair and Vidal Dhu. If I explained how much it affected the book, I would spoil the plot. Fairgrove, and Silverhair, are genuine do-gooders. But since the world is much more technical, they cannot conjure gold. No, they need to earn money. And that’s where this book starts. The plot moves on rapidly, and every decision, both good and bad, makes sense from the characters point of view. What makes this book so important is Tania, and her story. Tania is a runaway teenager. This is as much about her as it is about Fairgrove and Vidal Dhu. The characters had their flaws, both good and bad. Sometimes I wanted to scream at them, since they could be so stubborn. So, that’s what I liked but what I didn’t like: It might be because I haven’t read her books in awhile, but I didn’t like that there is always a runaway in her books. Or at least it feels like that to me. 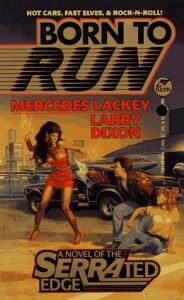 But, on the other hand it is the strong social theme that makes her urban fantasy novel stand out. So, I guess it is something I have to swallow. I am not sure if it is something I didn’t like, but I was struck by the fact that it is unusual to have the classic Sidhe/ Unseelighe rivalry as the main source of conflict. That could be because I haven’t read the right books. Summary: A bit dated, but still a good read.